Rosh Hashonnah is coming, Rosh Hashonnah is coming!!! Reb Leibele teaches that unlike other nations, who, the night before their day of judgement are somber, don't eat, dress in serious (black) clothing, sit trembling and worrying, we Jews, the night before we stand in judgement dress in white, eat and sing and dance, are happy with a surety that we will be forgiven, redeemed, and have the lease on LIFE renewed for all LIVING CREATURES AND CREATION ITSELF! Mamash unbelievable. What is going on? 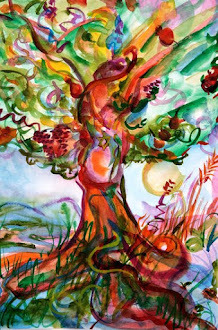 Reb Leibele tells us that in fact it is a Miracle from the Master of the World, the King of Kings, that he grants us our wishes, and renews our leases on LIFE, with all the specific caveats that apply to each and every individual creation. I want to say that we know this, we are counting on this, and just the same way that our prayers are answered before we ask, we give thanks - we sing and dance - before we recieve the judgement. Our energies from here, from down below ascend to the highest places, and bring down Shefa, Divine Effluence - Good Vibes from the highest places above. It's Tuesday --> Rosh Hashonnah around here. Unfortunately technical difficulties have pre-empted Maya's last show of the year. I guess we just don't want the word "last" anywhere near Maya's name, not on our roster, at least. IY"H, she will be back with a Vengence next Tuesday, 11-1 to Rock our mid mornings, and feed our mid day musical munchies. Having said that, there is still a lot going on 'round here. 7;00 - 8:30 PM - The Homegrown Hour (Math?) Yes, there is always time for Homegrown, time to listen to new music sent to us by YOU. Remember, Mp3 files are preferred, and yes, you know the drill: send your files to Radiofreenachlaot@gmail.com. We'll even try to tell you when we'll play your song! 8:30 PM --> Tuesday Night's "That's Rock and Roll" show is merging with "Cookin' for Shabbos" this week, as we head down the road to Rosh Hashonnah. You can be sure there will be plenty of good vibes music, talk and Torah to get us ready for the BIG DAY! Chazal tell us that even though we have 2 days of Rosh Hashonnah, it's really one long day. THE BIG DAY is coming down upon us. The books (do you think HKBH is using an E Book?) are open. Let's dance ourselves into the book of life - for ourselves, our families, our friends, our communities, our nation, all nations and the WHOLE WORLD. As for us, Radio Free Nachlaot? We'll keep doing our part - providing you with the best soundtrack for your life! Chag Sameyach everybody. Shanah Tovah Oomtookah. Have a Sweet New Year! Yankala Shemesh on Sunday Night Live! Gevaldt, the "Hi-Ho's" (High Holy Days) are almost upon us! We've scoured our brains as to whom to invite as our guest for the LAST "Sunday Night Live" Show of 5771 - and Reb Yankala Shemesh was the perfect choice! Yankala Shemesh joins Steve and Lorelai on "Sunday Night Live," Sunday September 25th at 8pm Jerusalem time - don't miss this very special pre-Rosh haShanah show - just in time to kick off the "Hi-Ho's," wherever you may be! 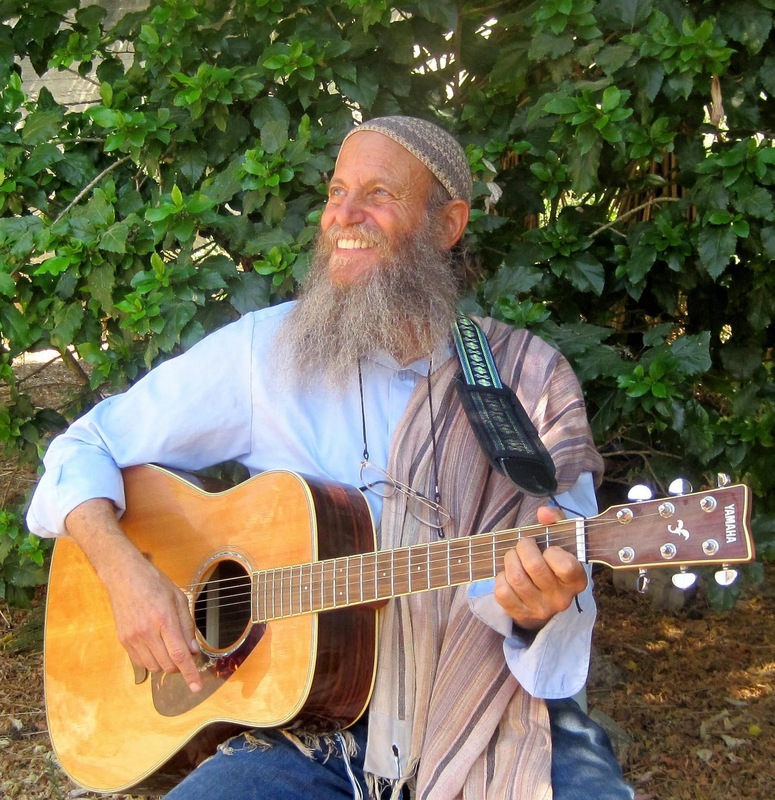 Reb Yankala has developed a Devekut Meditation Workshop :: a system combining deep Kabalistic Meditation with music, song, story telling and learning from Hassidic and Kabalistic sources and traditional Jewish texts. We'll hear more about that (and without a doubt, MANY Reb Shlomo stories!) Sunday at 8pm - "Watch us on the Radio" in live streaming video by BE THERE ISRAEL video broadcasting services. Saturday night, TONIGHT, we are spending our Melave Malke time with Ariel Elisha, LIVE from the Nacladorms - 18 Yosef Chaim street in Nachlaot - ( that's right - go there!) - music is starting after 9:30 PM, but if you can't, you can tune Ariel Elisha in right here on the radio! And that's not all that's happening here, SPECIAL, this Saturday night. ...and we continue with our pre-Rosh Hashonnah programming with a very special edition of Sunday Night Live, Featuring Yankele Shemesh, Sunday night, Sept. 25th between 8 and 11 pm. Yankele will bring us music and Torah to help us as we head on down the road to Rosh Hashonnah. Yes folks, we're on our way to the beginning of a New Year. And how do we get there? In my humble opinion, we get there through joy. B'simcha. Our Passport to tomorrow,. Yes, B'simcha people. We want to head up to the New Year with joy in our hearts and smiles on our faces. Yes, we know the "world" situation can lead us to despair, but hey, who's running the world? 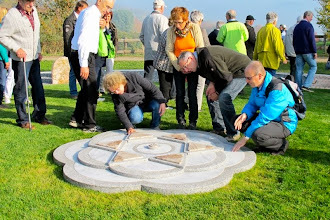 If we can wrap our heads around that one, then we know as long as we HONESTLY do our part - our individual part, our family part, our community part, our world part, with sincerity and to the best of each and everyone of our abilities, then HKBH, the Master of the World will do his part. 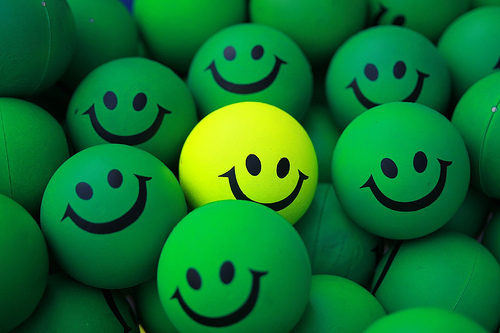 ...after that, all that's left is to smile, smile, smile. Radio Free Nachlaot - we'll do our part too, bringing you Music, Talk and Torah 24/6 (exceptin' Holidays) from Jerusalem's coolest neighborhood, Nachlaot. 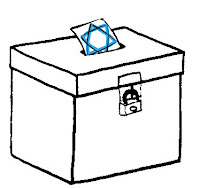 Remember, Nachlaot, not just a neighborhood, a state of mind. Friends - we've got a rare treat for you. 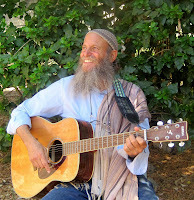 The technology isn't cooperating to be able to display on video, but if you launch a media player (VLC, Windows Media, Real Player, Quicktime) OR listen on iTunes Radio (under the "International/World" category) you'll be able to HEAR the One and Only Ariel Elisha Leon Rosen, LIVE in Jerusalem. Don't wait - listen NOW! Even though Radio Free Nachlaot is a "safe space" on the Internet where you can come chillax and be at home, world events occasionally intrude. Politics aren't normally our "thing" (causes stress!) but today at the United Nations, the Palestinians are going to ask for Statehood - with no intention whatsoever of accepting either Israel's right to exist or a true "2-State Solution." Their agenda is a 1-State Solution: a Jew-free "Palestine." 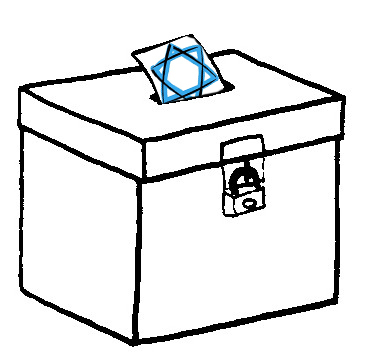 It's likely Shabbos will come in before the UN vote is completed and we may go into Shabbos not knowing how the Nations of this world will vote - but we know how G*d votes. 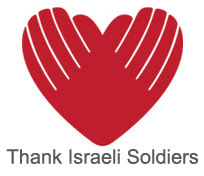 Dear friends, family and fans of Radio Free Nachlaot: Please pray for the peace and safety of the People of Israel. 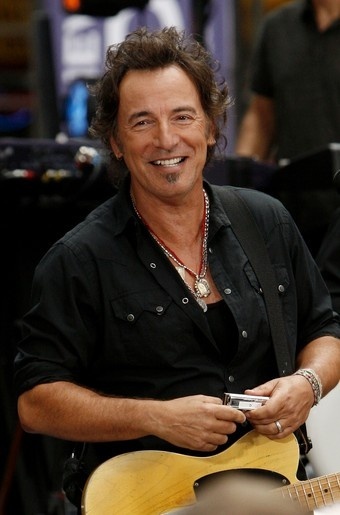 And meanwhile ... it's Bruce Springsteen's Birthday (yes it is), capping off a big birthday week on RFN - we had Leonard Cohen on Wednesday, Amy "The Night Nurse" Wachtel on Thursday, and today - The Boss, celebrating his first birthday without his life-long friend and musical companion, Clarence "Big Man" Clemmons. Must be feeling a little weird. So Bruce ... we've got you in mind as well today on Radio Free Nachlaot. Shabbos IS coming ... yes, Shabbos is coming, after what really feels like the longest week EVER. Let's remember Shabbos is "a taste of the World-to-Come," a safe haven outside of time/space where the holy circle is drawn around us - we are separated from the Evil Inclination, and all wrathful Authorities and judgements against us are banned and must flee from our presence. Let's take this time to hide beneath the Shadow of the Almighty (Psalm 91) where we are safe because the LORD our G*d, HKBH, Creator of the Universe keeps us. Shabbat Shalom everyone - Happy Birthday, Bruce - See y'all on the other side of Shabbos! Hey, what's the good of having your own radio station if you can't hijack the programming to play a special birthday show for your best friend? It's 9/22 - and anyone who knows Amy Wachtel (legendary "Night Nurse," reggae mistress-of-ceremonies and lifelong best friend of Lorelai) knows the "22" means - it's The Day! 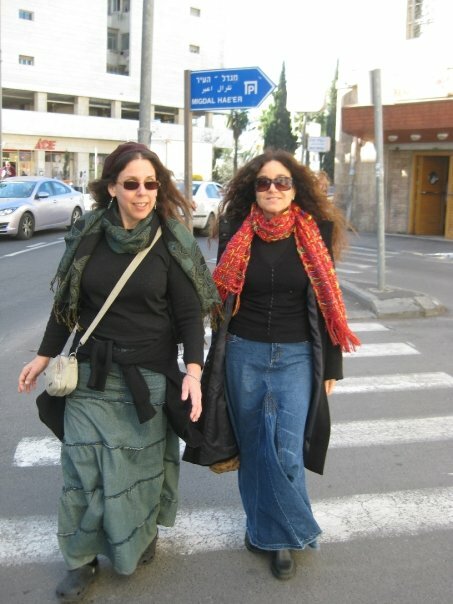 Lorelai and Amy met when they were new High School graduates just barely cusping at 18 years old, together IN JERUSALEM for a post HS program living with Israeli families and learning Hebrew (HA, you see how well THAT worked in Lorelai's case: NOT~!). They instantly bonded because of their common love for (amongst other things) the Grateful Dead, Diet Coke, Sweet n'Low, astrology, and escaping from authority figures. ... and don't forget COOKING FOR SHABBOS WITH STEVE LEVINE, sometime after 9-ish! It's Wednesday - time to celebrate the middle of the week and a birthday, as well. The middle of the week is always an interesting time. It's not quite Thursday, Friday or Shabbos. Sunday, Monday and Tuesday are behind us. Mid-week, positioned just right for something really special to happen. I guess that's why we always have such great programming scheduled for Wednesday. Something to highlight just how important getting to the middle of the week is. That's right, Celebrating the Middle. Celebrating the heart of the matter. And what exactly do we have scheduled for today? Midday on Wednesday we have the Crimson Stone Skruffy Jazz show, at 7:00 PM we have Brian Blum's Brainwaves, and then at 9:00 PM we have Maya. Mid Week momentum - getting us in gear to finish off the week even stronger than we started. Mama don't allow no running out of steam around here! And just to make sure this Wednesday's programming is a little more special than normal, we've been given a birthday to celebrate. That's right. 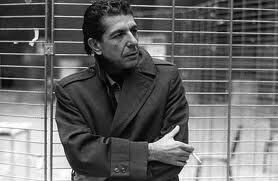 It's Leonard Cohen's Birthday. Leonard Cohen, 77 years young, and still going strong. Poet, songwriter, performer who played Israel just about a two years ago! Well then Mr. Cohen, sing us a song, read us a rhyme. And to show you just how we feel about Leonard Cohen, about 3:30 today we'll play Leonard Cohen's Songs from the Road, cause hey, we love Leonard Cohen! ...and we Love you -- all of our loyal listeners and supporters -- too. C Ya on the Radio, everybody. It's Wednesday. let's celebrate having made it to the middle of yet, another week, shall we? It's Tuesday - are you ready for some Rock and Roll? Tuesday is Rock and Roll day at Radio Free Nachlaot. Why? Because it just feels that way! Tuesdays and Rock and Roll - they go together, no? Well, ask Maya what she thinks as she feeds our midday musical munchies with the best of the 70s, 80s, 90s, newer, older "Maya Rock and Roll" as only she can. We of course won't abandon our Israeli-Soul afternoon, and in fact today we're going to let Herbie Hancock and Friends - jazz with a "current" edge - lead us back into the Rock and Roll. Hey jazz is cool and maybe Jazz is your rock and roll? Could that be true? And what exactly is Your Rock and Roll? Let Steve try to help you sort that out between 9:30 and Midnight during his "That's Rock and Roll" show, exploring all types of music that will get you to exclaim, "Yes, That's Rock and Roll!!" And if that's not enough, remember it's only Tuesday, the week is young! Wednesday features: The Crimson Stone "Scruffy Jazz" show at Noon. Now, we know the Scruffy Jazz will be here, the question is, how will it be delivered? Stay tune, cause only Mr. C. Stone knows, for sure. 7:00 - 9:00 PM Jslm time, (9-11 Am New York, Noon - 2 PM L.A.) - Brainwaves - Brian Blum's new hit radio show, featuring the best eclectic/Indie/pop/rock music, and more! 9:00 - 11:00 PM Maya's Journey into the music of the night. NIGHT MOVES - brought to you by Maya. Let Maya move you through the night. Let Maya move you! Thursday means "Cookin' For Shabbos" - but there's plenty of time to tell you about that! Oh, but I don't want you to forget that M"S is Selichos night, and we will be playing Shlomo's Selichos at Midnight Jslm time, and again at 7 am (Midnight NY Time) and 10 AM ( Midnight L.A. Time) for all of our other time zone friends. I think there's too much to do, already! Shavua Tov everybody, after a restful shabbos and a rockin' Saturday Night, can it be Sunday already? A new week, a new line up of events -- not to mention the regularly scheduled ones that take up all our time, as it is! Oh boy, am I a complainer? Not at all. 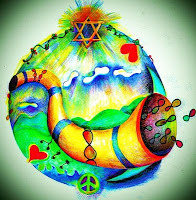 Thank G-d for so much good stuff to do, and the koach (energy/strength) to do it! 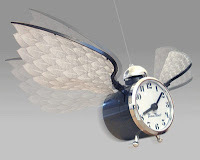 It is good to give thanks to Hashem, take a pause, and keep moving. So, what's on the schedule? There are two major events today,. and we will cover at least one, and maybe both. 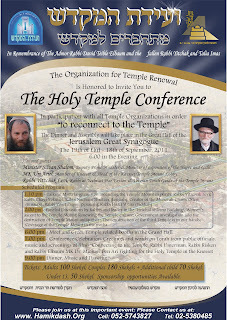 Now, the first event is about one of our favorite subjects: The Holy Temple. and then, event number 2: - the Jerusalem Soul Center's Grand Opening! NEW JERUSALEM SOUL CENTER SPACE GRAND OPENING!!! It is a tremendous honor to invite you to the Grand Opening of the new Jerusalem Soul Center space in downtown Jerusalem. This truly beautiful new space is located at 20 Rabbi Akiva Street- Turn onto Rabbi Akiva Street from Hillel Street (next to Aroma Cafe and across from the Italian Synagogue) and proceed through the parking lot all the way to the end of the street next to Gan Haatzmaut. Please bring instruments & alcohol -- Spread the word and come toast this new space dedicated to spreading light and joy here in our holy city of Jerusalem. Bsimcha Tamid!!! It's going to be a busy Sunday -- but as Jerry and the boys say, ....enjoy the ride!!!! That's right. We've "gone south" here at Radio Free Nachlaot. First of all. "Mama-Radio" is heading South for Shabbos to some undisclosed desert location -- or is that an undisclosed deserted location. I know she won't be alone, but then again, an Ashkenazit amongst Morrocans ?? I'm sure we'll hear all about it! 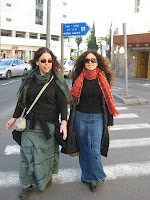 Now, in honor of Loreali's Southbound tripping, our Israeli-Soul afternoon will give way to some of our favorite "Southern" rockers -even if they're not from the South! Coming up this afternoon we'll have: The Allman Brothers, Hill Country Revue, Gov't Mule, and the Derek Trucks Band. And then, not to worry - Steve will start to bring us to Shabbos with his "Cookin' for Shabbos" starting, as it does every week at 10:00 PM. That's right. It's already time to be "cookin' for Shabbos." Can you believe it? Well I can, cause i've got the cookin' to do -- but face it, isn't everything easier when you're listening to your favorite, member supported internet radio station? I mean, doesn't eveything taste better when it was salt and peppered with the music, talk and Torah coming at you from Radio Free Nachlaot? I bet it is!!!! Now. if our regular programming isn't special enough, Cookin' for Shabbos is dedicated this week to Steve's wife Rena, who's birthday is, you guessed it, TODAY! A special menu with the musical treats that Rena likes the most is being prepared right now for our mutual entertainment. When Rena programs, we all listen!!! Have a great day, everybody - C Ya on the Radio! Wednesday's Child is Full of ... Steak? Maya continues to send us pictures of her trip through America - one steak at a time. OK, so there's steak, there's ribs, there's ... MEAT. A whole lot of meat - Kosher, of course! - and luckily because she's young, works out and is high-strung, she's got great metabolism and she can afford (biologically, at least) to eat her way through the U.S.A. ... but really, all these meat pictures! Some of them are just so ... meaty, we just can't publish them on a "family web site" like RFN. We're just warning you. Tonight's show (9pm Jerusalem time) is supposedly going to be a lot of SOUNDTRACKS but we're suspecting what's fueling Maya's musical choices these days is a whole lot of ... meat! So don't drink any milk before her show, or you run the risk of de-koshering the inside of your brain. 7pm TONIGHT, Brian Blum brings us his BRAINWAVES - 9pm, it's Maya's "Soundtracks" Show - we had awesome Skruffy Jazz this morning by the Crimson Stone - you may even see Steve Levine's (magnificent head of hair) on the radio this afternoon - it's the "peak of the week" already, we're slip-sliding towards Shabbos again, really ... but we're almost there! Stay with us! Thursdays we "cook for Shabbos" and it's Shabbos again. Happy Week everybody. Happy Life. Reb Leibele Eiger says that the first word of Parshas Ki Tavo is V'Haya which teaches us of Simcha. Happiness. My friend's father in chutz l'aaretz died, and the funeral is today, 3:30 NY time - I said I'd be doing my Rock and Roll show, and he said play something "Uplifting." Raise it Up. Kadosh, Kadosh, Kadosh. We rise up everyday to take on the world, and bring it Simcha - music, Torah and talk from Jerusalem. Happy Week, Happy Life, Happy Shabbos.... and it's only Tuesday? 11 - 1 - Mid Morning Maya playing Music to cure your mid morning musical munchies. 9:30 - 12:30 (or so) Steve's "That's Rock and Roll" show. Noon time, the Scruffy Jazz Show. As is the case with all real "scruffy" Jazz guys, the question isn't what will he play, it's whether he'll show up!!! 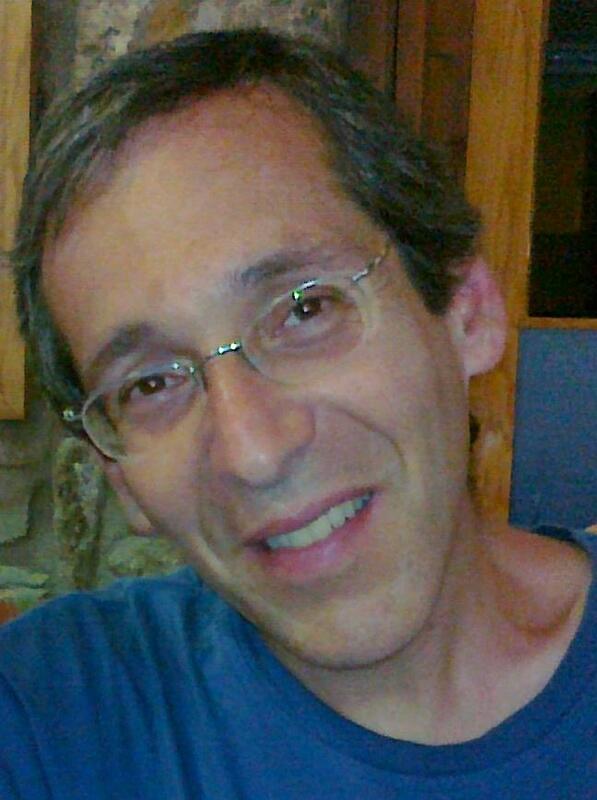 7 - 9 PM - Brianwaves, with Brian Blum - after being off the air for 28 years, you know Brian will be here! 9 - 11 PM - almost Midnight Maya with her "Night Moves" playing music for ya -- this week featuring music from Movies and Shows. Watch when you can. Listen all time. It's the day that's been approaching for a while now - the 10-year anniversary of "9-11" - the day "our world changed forever," as it's been said by more than one commentator. Tonight on "Sunday Night Live," Steve Levine and Lorelai Kude will bring you a special 9-11 themed program. It's about remembering, forgetting and remembering again. Not entirely a coicidence that we just read Parsha Ki Tetze in the Torah yesterday on Shabbat - where we are instructed to always remember what Amalak did to us, and not to forget, and to keep remembering until the memory of Amakak is wiped away entirely - even from (according to the Midrash) the Throne of HaShem Himself. As the world around us here in Israel grows tighter and tighter, it's astonishing to see, 10 years after Islamic Jihadism declared war on America and all America stands for (and by extension, Israel and all of what we call "Western Civilization") how successful radical Islamic fundamentalism has been in the last 10 years. At this very moment a band of terrorists are readying to unilaterally declare themselves a "state" right here within the State of Israel, in the Biblical Land of Israel, and the world stands either idly by OR actively encourages the creation of a monstrous entity that has already declared it's intention to destroy us and then the rest of the world until all knees bow to Islam. But ... never mind! It's Radio Free Nachlaot, where we're going to give you the low-down on what's REALLY going on with our hearts and our chevre right here in the Holy Land, in the U.S. and everywhere else where there are sane, caring people. 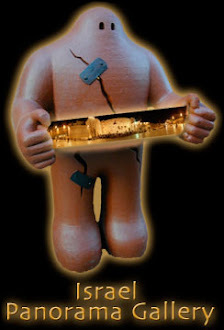 HKBH is enabling us to bring our unique perspective to you - in words, in music, in dialogue - from right here at the REAL "Ground Zero" - Jerusalem, heart of the Holy Land, Center of the Universe. Join us at 8pm tonight from the Center of the Universe as we remember 9-11 together. It's Sunday. The new week has arrived. Have you? I mean, I know that the calendar has changed to a new week for all of us, but do we realize the power of a new week? The power of new beginnings. The power that each and everyone of us has to make a difference. A difference in our individual lives, our family lives, our communal lives, and in fact, to make a difference in the world. Think about casting a stone on the pond. Ripples. Not just the name of a cheap (unkosher) wine, or a favorite Grateful Dead song. Not just an old metaphor. Real things happen when we just get involved. You don't believe me? Well, what's that internet radio station you're listening to? 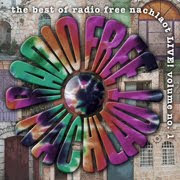 Where do you think Radio Free Nachlaot came from? We know that we're making a difference, and we intend to continue doing so. 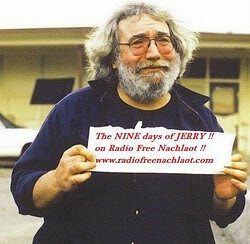 That's right, Member Supported Radio Free Nachlaot. Help us make a differenece. Become a Member. See what you can do. See how good it feels to be an active part of our family! But not too worry, we love you for supporting us in all the ways you've been doing so far. ....but you know, a few rubles can't hurt! We've got a great week of Radio, ahead! It's Motzoei Shabbos. Shabbos is going away. The week is upon us. Elul. A month to get closer. Our Rabbis tell us the King is in the field. He's approachable. We can go out, and walk with him. You know, we really don't need Elul, or Rosh Hashonnah for that. We don't need Shabbos for that . We don't need "loosing" Shabbos for that. But sometimes we do need that extra motivation, that extra push from the outside. Ok. So we're pushin'. 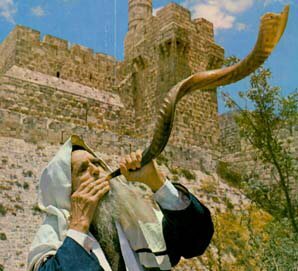 Good Vibes, Torah and Music from Jerusalem to the whole world. Shavua Tov. Shavua Tov. Let's get this week going the right way -- Shlomo to help us out and music to help us through. That's what "Melave Malke Meets Saturday Night" is all about. And tonight we have a special for you -- 11:00 PM, the Diaspora Band, a Melave Malke recorded Motzoei Shabbos many years ago right here in Yerushalayim. -- How's that as a way to start our week. Sounds like a plan, to me. Shavua Tov, Good Shabbos, Good Life! From Radio Waves to Brain Waves, It's Wednesday! Yes, one week after breaking a 28-year hiatus from radio, Jerusalem's own BRIAN BLUM returns TONIGHT (as he will every Wednesday night) for his show, BRAINWAVES. BRAINWAVES is an eclectic rock music program spanning multiple genres and decades. Each two-hour sonic adventure might go from modern indie pop rock (Snow Patrol, Fountains of Wayne), to classic 70s progressive (Peter Gabriel-era Genesis), to 80s new wave (A Flock of Seagulls) and 80s jangly pop (early REM, Marshall Crenshaw), to melodic grunge (Smashing Pumpkins), along with a healthy dose of Israeli rock (Aviv Gefen, Erez Lev Ari). You are not going to want to miss Brainwaves, Wednesday night, 7:00 - 9:00 PM. Tonight's show will feature: REM, The Decemberists, Blackfield, Guster, Counting Crows, a 70s pop set and introducing Niv Kaikov, a dynamic young Tel Aviv artist! Oh, and don't you fret, even though Maya won't be here from 9 -11 PM tonight (She will return next Wednesday night) we will honor her weekly voyage into the world of Maya's Night Music and play Pearl Jam, live from Madison Square Garden, NYC, recorded in 2010. We are Member Supported Radio, and we just want to say Thank you, for all your support! Yes! Tuesday is upon us. 3rd day of the week, 3 Live Shows to entertain you - on top of our always entertaining programming, of course. First Up: 12:00 - 2:00 PM - "Mid-Morning Maya" moves to mid-day for today only. Busy people need some flexibility, so we'll let Maya take care of our Musical Munchies, as she does every week, when She's ready! Number 2: 7:00 - 8:00 PM - The Homegrown Hour. We have an ever evolving, revolving bunch of new music, sent to us by YOU, our listeners. Join us - hear yourselves, and your friends right here, on your favorite Homegrown station. ...and last, but not least, Number 3: Steve's "That's Rock and Roll," starting around 9:30 PM will not only feature music that is bound to get you to exclaim, "Yes, That's Rock and Roll!" but will also feature a visit from our good friend, Mr. Rock and Roll himself, David Berezin-Bahr. David's visiting from N.Y, and I can't wait to hear what music he's brought to share with us this trip! So, let the week continue, and the Tuesday festivities begin! Retail Therapy. It's what makes the world a safer place to live - especially when the need to calm and soothe ones's self is overwhelmingly urgent. 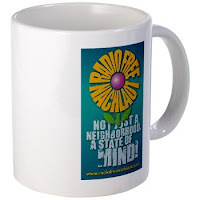 May we suggest visitng Radio Free Nachlaot's Schwag Shop? You'll find RFN-branded bling galore - you'll be VERY relaxed after spending a few minutes perusing our wares! Your purchases help support our programming. Don't forget - some of the swag is available as GIFTS to you for becoming a MEMBER of Radio Free Nachlaot! It's like ... two! Two! Two awesome gifts in one! Boy does time fly when you're having fun! Yes, being busy 'round here amounts to "having fun." And you know how busy we've been. This week, the first week of the new (now current season) has started us off with a bang. We've introduced you to Brian Blum and his Brainwaves show, we spent time with Jonty Zwebner and heard all sorts of new music during our Homegrown show, we welcomed "Mid Morning Maya" / "Night Music Maya" back for her two shows and of course Steve did his Rock and Roll show at the new start time of 10:00 PM. And now, Thursday, we'll play some Asaf Avidan, and "live" Los Lobos, as we get ready for Steve to take us home - Cookin' for Shabbos starting at 7:00, really starting at 10:00 PM, and taking us all the way to Shabbos! Gevaldt. Where does the time go? Hey, if life is going to slow, just turn on the radio, and step into the RFN zone - you know what, time won't matter, you'll be having fun, and we'll tell you when to turn off for Shabbos, and when to turn on for Melave Malke Meets Saturday Night after Shabbos. Can you ask for any more than that? and remember, we can only be User Supported Radio if you support us. Hit that Pay Pal Donate button, and keep us, and you rockin'.